Dr. Harrison currently serves on the executive board for the California Campus Compact, the Climate Leadership Steering Committee, and as a commissioner on the WASC Senior College and University Commission. In 2015, she was re-appointed by California Governor Jerry Brown to serve another term on the Western Interstate Commission for Higher Education, having been initially appointed in 2011 and serving in 2014 as chair of the Commission. 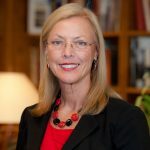 In September 2015, she was appointed to the NCAA Board of Governors and has served on the NCAA Division I Board of Directors and the Division I Presidential Advisory Group since July 2014. Her appointments at the NCAA includes service on the NCAA Board of Governors’ Commission to Combat Campus Sexual Violence, the NCAA Division I Committee on Institutional Performance and the NCAA Historically Black Colleges and Universities and Limited Resource Institutions Academic Advisory Group. As an active civic leader, she serves on the boards of directors for the Los Angeles Area Chamber of Commerce, the Valley Industry and Commerce Association (VICA), and Valley Presbyterian Hospital. She is a member of the Los Angeles Cleantech Incubator Leadership Council and the Los Angeles Coalition for the Economy and Jobs. She also serves on the Board of Governors of the Valley Economic Alliance, the Executive Committee of the Los Angeles County Economic Development Corporation, and the Advisory Council of BizFed. She and her husband, John Wujack, reside in Northridge.